Small Life Form returns with a feedback driven quest for sleep & the destruction of self. 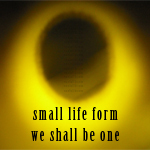 US project SMALL LIFE FORM have been around since 1998, and is a creative vehicle for composer and musician Brian John Mitchell for his electro-acoustic drone constructions. “We Shall Be One” was released in 2013, and is a contribution to US label Silber Records ongoing “5 in 5″ series of five minute long EPs consisting of five tracks. In the five minutes of playtime on this EP we’re basically treated to three rather different kind of construction. There are two pieces that sounds like a heavily distorted, electronically treated spoken voice. Interesting and intriguing experiences by and large, but also creations that resides if not on the outside then at least on the border between what may best be described as music and what may be best described as effects. Two additional constructions revolves around a light toned, unnerving drone. One futuristic sounding that I found to be rather hard on the ears and the mind both, and one somewhat less intense with more of a nervous nature to it and with subtle echo effects. As for the third type of sound explored, we’re treated to a rather magnificent rich, dark toned surging drone. To my ears a clear highlight as regarded from a music point of view. That’s the thing about this EP though, that this isn’t a production that reaches out to those fond of conventional music, or even drones applied in a more conventional musical manner either. This 5 minute, 5 part production is rather one that will satisfy the tastes of those fond of drones and electronic effects in themselves, and that will revel in the total experience of the brief story told by the song titles and the sounds used to represent the different parts of that story. My rating comes primarily due to my personal taste, obviously, and those who recognize themselves in the description given in the former paragraph are likely to regard this production in a much more positive light than yours truly. Small Life Form’s ‘We Shall Be One’ is the sound of biology gone astray. Unable to focus on melody or any form of progression it is reminiscent of tiny microorganisms. The surreal quality of these songs is quite disturbing at times. By using something so abstract it moves beyond mere ambience or noise into an entirely different field of sound. Elements within the sound itself reappear multiple times creating a fractured sense of theme. Through the process of evolution the sounds merge to build a larger greater creature. ‘you sound like you have something to say’ is exactly that. Words are distortion past the point of no return. Nothing holds the sounds together. Drones are purposeless. Melody is nowhere to be seen. Rather the sound is an abrasive series of noises. ‘stay out of my head’ takes a sustained tone and uses it for the duration of the track. Here there’s little in the way of development although it manages to be a bit easier to comprehend. Real comprehension begins with the middle track. Previous experiments come together as if parts of a puzzle to create a fuller sound. Towards the end Small Life Form gets more drone-orientated. ‘now i understand all the things that you mean’ goes through various cycles of the drone. Akin to an organ it soothes with its wave-like wonder. For the finale ‘we shall be one’ a sense of hope pervades the proceedings as the drone approach comes towards its conclusion. Ultimately the EP appears to work off of itself trying to incorporate little moments into a big picture.